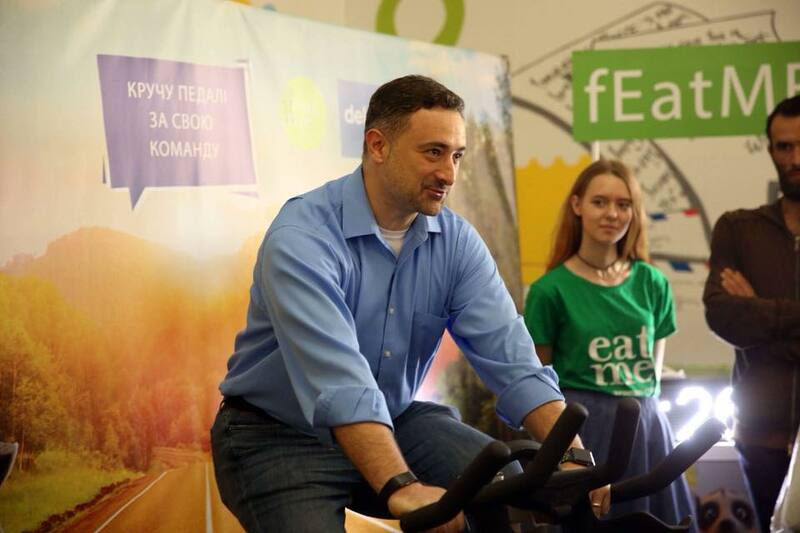 The first week of the contest of corporate teams fEatMe supported by Eat Me™ and Delo.ua ended with the victory of the healthy corporate spirit and two outstanding records. The participant from the 1+1 channel team “cycled” for 16 kilometers on the simulator, setting a goal for himself to win a set of 4 assorted Eat Me bars. The second record – 140 minutes of continuous pedaling – was set by a petite girl from the company Vodafone Ukraine, inspired by the opportunity to win a collection of super-nutritional bars Eat Me of her favourite flavours. “In the autumn, my colleague and I planned to buy several packages for us two, – the record-holder recalls. – But the vending machine did not always my favorite flavours. And then the Universe responded to my wish with such an interesting event and a delicious reward”. It is worth noting that all participating companies have worked together and diligently carried out the task, having spent all day on the exercise bikes. Is it possible to act differently if you are inspired to pedal by the company’s CEO? And one who not only inspires, but does it himself and teaches all who are interested different styles of cycling! In addition, for each new kilometer on the bike, the participants were given a super-nutritious bar of EatMe for restoring their energy. The fEatMe event will continue for another week. According to the results of the corporate competition, the winner will be the team that will pedal the largest number of kilometers on the stationary bike before 6:00 pm – it will receive the title of “Company with the best healthy corporate spirit” and delicious gifts from New Products Group. Ihor Smelyanskiy, general manager of “Ukrposhta”.